Marilyn's eyebrows were angled and of medium thickness. Marilyn Monroe was not just famous for the movies she made, but also for the way she looked. Her staple red lips and high-arched eyebrows accentuated her face and helped her express herself. Whether you are a fan of Marilyn, or just like the way her eyebrows looked, you can easily copy them right at home. Because your facial features differ from Marilyn's, the eyebrows may or may not look as good on you as they did on Marilyn. Look at photos of Marilyn Monroe that clearly show her eyebrows. Look for photos in which she wears minimal or no makeup because eyebrow makeup can alter the natural shape of an eyebrow. In some photos, her eyebrows may be somewhat thicker in width than in others. Her eyebrows always had noticeable angle. Realize that Marilyn's eyebrow shape may not be the ideal shape for your face. 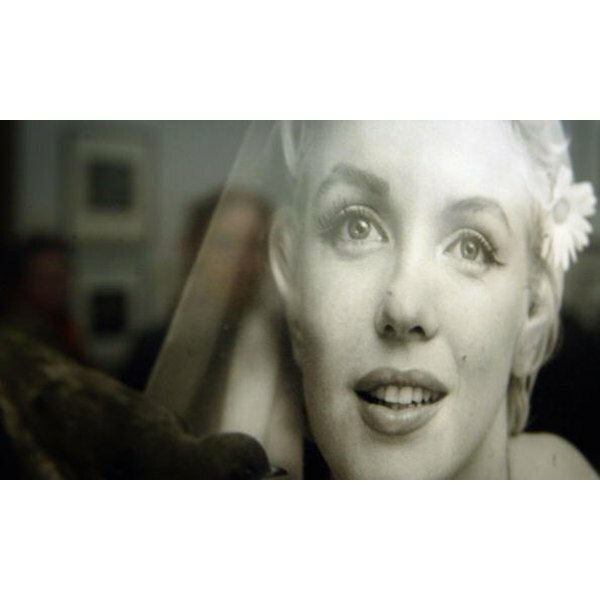 Marilyn had a round-shaped face and the high, angular brow accentuated her features and made her face seem longer. If you have an oval face, the Marilyn brow may work well, because this shape of face looks good with many different eyebrow shapes. A heart-shaped face looks best with rounded eyebrows, and flat eyebrows flatter a long face. Use a dark-colored eyebrow pencil and draw a similar copy of Marilyn's eyebrows over your own eyebrow hairs. Try to make your left and right eyebrows look similar. Purchase eyebrow stencils inspired by Marilyn Monroe for an easier approach. Place the stencil over your own left eyebrow and trace the outline of the stencil. Remove the stencil and repeat the process on your right other eyebrow. Remove the hairs that fall outside of your outline. Stretch the skin between the fingers of your non-dominant hand and hold your tweezers in your dominant hand. Pull out one hair at the time. Tweeze excess hair in between your brows, underneath your brows, and to the sides of your eyebrows. Frequently check your progress in the mirror to avoid overplucking. Remove the eyebrow pencil from your eyebrows with an oil-free eye makeup remover. Brush your eyebrow hairs in place with an eyebrow brush. Fill in sparse areas of your eyebrows with eyebrow powder. Apply the powder with light strokes in the direction of the hair growth. Brush eyebrow gel on your eyebrows to hold them in place. Spray hairspray on your eyebrow brush and run it over your eyebrows as an alternative.